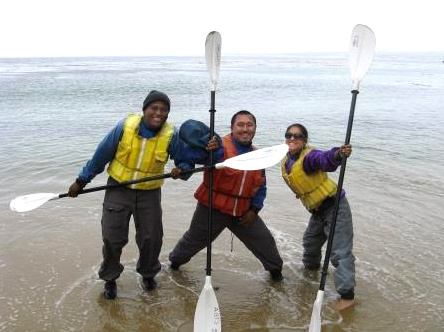 The programs at Rancho Cielo provide a unique opportunity for youth to engage in activities that encourage learning, build self-esteem, create positive relationships with adults and help them relate to their community in a new, constructive way. Rancho Cielo is a nationally-recognized collaboration, a public-private partnership, one that brings expert resources together to benefit those youth who have the fewest options available to them. The primary clientele of Rancho Cielo programs are youth on probation, but not all of our students have been in trouble previously. The design is simple: fund a program at a high level of resource to nurture and facilitate youth who need more supportive supervision and positive personal attention than students who are successful in the traditional school or probation-supervision model. RC was designed to be a wrap-around services model, a “one-stop shop” for youth who need extra care. The adults in the program are expected to set an example of pro-social behavior. We must role model for the youth appropriate ways of dealing with conflict and with the complexities presented by the barriers in the lives of our students. When a student makes a poor decision, we don’t judge him/her. It means s/he made a mistake. If the student takes accountability for the decision and is able to articulate the learning from the mistake, we can move on. We don’t yell or blow whistles at students. Adults in the program role model self-control and the other characteristics that we want the students to take with them from the program. We listen to the students respectfully, modeling how to behave in a professional environment. We address the students in a professional manner, with mutual respect. We apologize when we make mistakes. One of the primary assets of Rancho Cielo is the Ranch Property itself. We take advantage of the beauty of the space and the outdoor opportunities it provides, whether for science education, outdoor recreation, or just sitting around to get fresh air and enjoy the sunshine. Our programs also represent exciting collaborations with local civic, educational and law enforcement agencies. They would also not be possible without the donations and support from volunteers, local businesses and individual donors. We are lucky to work in this beautiful place and make a difference in the lives of these youth. Supportive services: uniforms where required; referrals to outside resources, such as behavioral health, healthcare, and basic needs. Transportation within Salinas area or pick-up at MST transit station. Bus passes available. Personalized Individual Development Plan with Case Manager. Case Manager to complete Job Readiness activities with participant. Earn High School Diploma in small classroom setting with individualized instruction. Rapid credit recovery. To apply to any of our programs click here.